Sadly, it seems I do 75% of my yearly reading during our April beach trip. I read during the entire 12-hour drive there, as much as possible during the week, and then every second of the 12-hour drive home. I read like it's my job...it's a non-stop reading extravaganza. And thank God I don't get car sick, or I might not actually finish a book the entire year. Last week I managed to plow through Bringing Up Bebe, and I would highly recommend. Despite all the controversy and hubbub re: French parenting vs. American parenting, this is a fantastic book... You will for sure glean something helpful from it regardless of your stance on the matter. I promise. I also finally finished Blood, Bones & Butter (my "raging love affair" with this book started in February and was then stalled by, well...life). It was worth the wait. That book is magic. Raw and honest and poetic and inspiring. I loved ever single page (well maybe not the page about the rat in behind Prune, but I loved all the other pages). The one thing I always wish I had more time for is reading. It is truly at the tippy top of my list of happy makers, and yet it somehow always (always) falls by the wayside (save that blissful voracious week of reading in April). The stack of books and magazines next to my bed is groaning -- a little neglected leaning tower of temptation. No matter that there's so much un-read material sitting there all forlorn, I still have a perpetual "to read" list going in my little day planner. 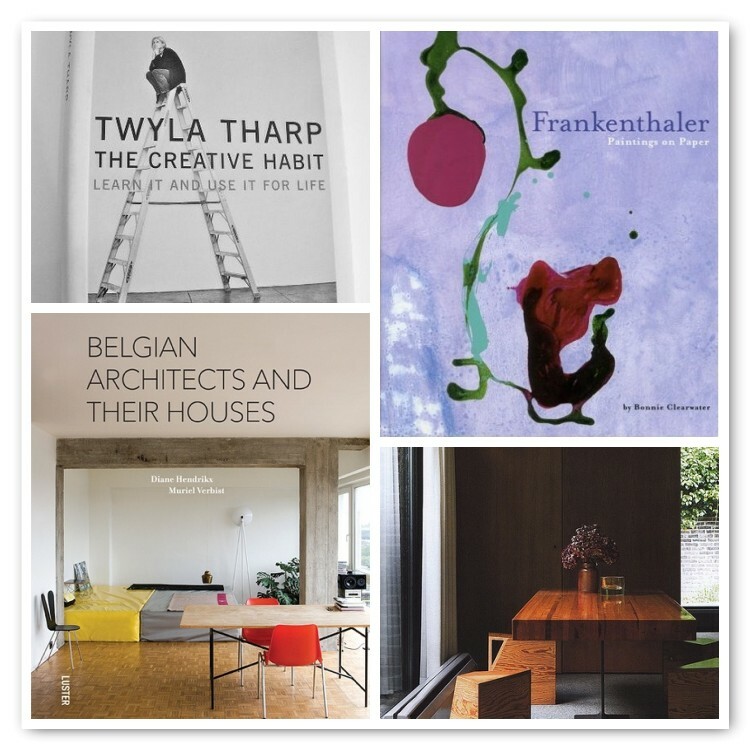 Here's what's currently on it: Twyla Tharpe's The Creative Habit, anything about Helen Frankenthaler, and (while technically more of a photo book) Belgian Architects and Their Houses. How often do you guys get to read? Is finding time for it as tough a nut to crack for you as it is for me? Oh and what are you reading of late? I read constantly. I am incapable of going to sleep without reading, even if I'm so tired I only read a few sentences before my eyes shut, if I'm bookless I'm suddenly filled with insomnia-inducing anxiety. I usually have 1 fiction book and 1 nonfiction book going, nonfiction usually gets read in little spurts in daylight, and the fiction puts me to sleep. I've read Twyla Tharp's book and I just loved it, and my current nonfiction is The Happiness Project, also highly recommended! For years I read constantly, then, kids, changing jobs, changing cities--all got in the way. I recently joined two book clubs, which means I am reading two books a month. Some months this is like a job I am failing to do well, but other months it is just divine. I just finished Molokai, historical fiction about a leper colony in Hawaii, and Wild, a wonderful memoir about hiking the pacific crest trail. Both made me cry good tears. I can't believe you can read in the car! I can barely text while being a passenger, I have such horrible motion sickness. I too have stacks of magazines and books next to my bedside table. Lately, I have been reading parenting books which are difficult to finish as it just reminds me of all the things I need to be doing better or differently. Can't wait to read "Bringing Up Bebe". Interested on what else you have to say about it. I have a hard time reading at bedtime b/c I fall asleep and end up forgetting the last few pages so I have resorted to lots of magazines! But maybe I will put down my laptop tonight and pick up a good book instead. Yeah, I can't read in the car either! Although I could on the train back in the day... Anyway, just got back from a short vacation solo to Chicago and read all the way there and back on the plane ride, so relaxing not juggling a kiddo and getting to really dig into a good book. I take public transit to work and sometimes that's the only time I have to read. But then again, a really good book will make me put my laptop away, stop making plans, and finish it. In the last two weeks I've read the Girl Who Kicked the Hornet's Nest and We Need to Talk About Kevin, which were both so bleak I went out and bought a palate-cleansing non-fiction called The Social Animal by David Brooks. I wish I could read in the car as well, but when we go on trips my husband would hate that I do not keep him company and I get car sick anyway! I love reading, but I get to do it only when I travel alone. Then I slip into a marathon of book reading - movie watching - etc. to catch up with... everything! Finding the time is tough but nothing beats that feeling of not being able to put a book down. I'm experiencing now with Wild by Cheryl Strayed, which I think you would love. My husband says between my exercise and reading it's worth it to him to have household chores undone because those two things seem to keep me more sane. Finished reading Yann Martel's "Beatrice and Virgil." An odd tale that suddenly morphs into horror and pain (as you realize what the book is actually about)... Still trying to figure out the book in my head. Next up is a compilation of Japanese detective tales! I couldn't live if I couldn't read. Like Besty I have undone chores but I'm a happy mama. I'm in the middle of bringing up bebe and I agree it's really good w/ gerat advice. I started Blood, Bones & Butter but had to return it but I'm on the list again. I read non-fiction and then lots of romance!! Those are easy and relaxing!!! heather -- ooh yes Wild is on my list too! Lately I've been perfecting the art of breast-feeding one-handed so that I can read with the other hand. Certainly helps keep me awake in the middle of the night! I just finished Rat Girl, by Kristen Hersh (of Throwing Muses fame), which I adored. Also recently read and loved Pulphead Essays by John Jeremiah Sullivan. Now onto Wildwood, by Colin Meloy, which is different from my usual list, but it's refreshing and intriguing too.